The growing geriatric population includes gender minorities or the LGBTQ adults who present with a rich history of unique experiences that have invariably affected the provision and access to quality health care services. 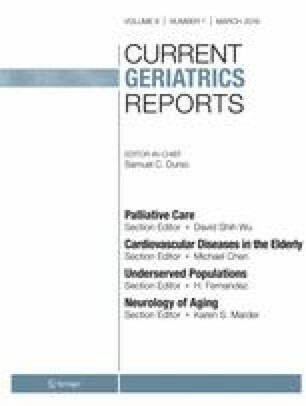 The purpose of this article is to review, understand, and discuss the differences and similarities of health-related geriatric issues within and between them. Based on the existing literature, relevant findings include the identification of multiple marginalized identities within oppressive social systems, negative health outcomes, and the presence of health care disparities as shaped by economic barriers, discriminatory regulatory policies, and stigmatizing practices by society and the government at large. There is therefore a call to action to provide better health care by instituting reforms in policies, cultural competency training, improved data collection of gender identities and sexual orientation in national surveys, better research, and a cultural shift in the way this population is to be universally treated. Noelle Marie Javier and Austin Gerhard Oswald declare no conflict of interest. United States Census Bureau. Population Estimates. 2014. https://www.census.gov/newsroom/facts-for-features/2016/cb16-ff08.html. last accessed August 18, 2018. LGBT. Older adults in long term care facilities: stories from the field. SAGE, Lambda Legal, and National Senior Citizens Law Center collaboration. 2011. https://www.diverseelders.org/resource/lgbt-older-adults-in-long-term-care-facilities-stories-from-the-field/. Accessed 3 Dec 2018. Metlife Mature Market Institute. Still out, still aging: the Metlife study of lesbian and gay baby boomers. 2010 https://www.tandfonline.com/doi/full/10.1080/15504280903472949?scroll=top&needAccess=true. Accessed 3 Dec 2018.